All transactions are safe and secure with a reliable history in online purchasing behind each of our associates. 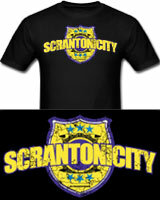 Buy the Scrantonicity Band t-shirt to own Office clothing and merchandise. Scrantonicity is a band that features office accountant Kevin Malone (Brian Baumgartner). The band name is a portmanteau of Scranton, Pennsylvania and the 1983 Police album Synchronicity. The group is recognized as a Police cover band, making their first appearance on the show playing "Don't Stand So Close to Me" during the season two finale "Casino Night." This Scrantonicity Dunder Mifflin t-shirt is a great looking tribute tee to the band that also covers Sting songs. In addition to the Scrantonicity Band tee above, browse the Office Clothing Gallery for more apparel like men's and women's clothes, kids shirts or hoodies.